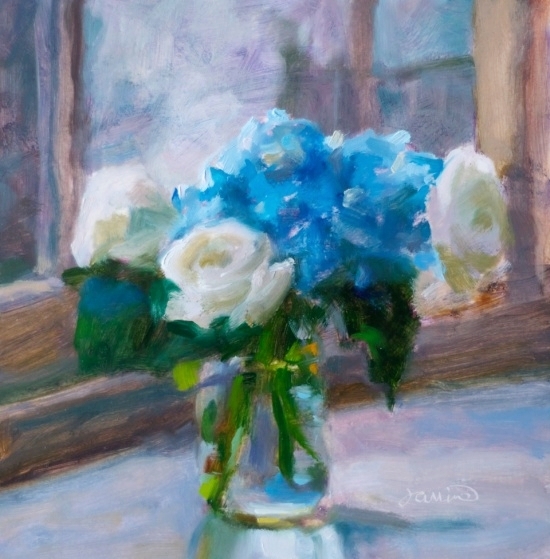 Janine Dunn Wade — Kiesendahl + Calhoun Fine Art, Ltd. Considering the breakneck pace of American society today, it is important to slow down and take a deep breath...to sense all the God-given beauty that surrounds us. A painting can capture those fleeting moments that sometimes pass us by without notice: flower buds in springtime; colorful sunsets peeking out from behind trees; the simple smile from a stranger; the earth washed clean in a good drenching rain. To capture forever joy, exuberance, beauty and life's quiet moments amid the chaos is my ultimate goal in painting. Wolf Kahn said, "Art exits to celebrate, exalt, excite, and satisfy the demands of the visual. To make the human spirit soar." I work to allow the viewer that rare moment to relive and celebrate...to emotionally connect with a moment and place in time.